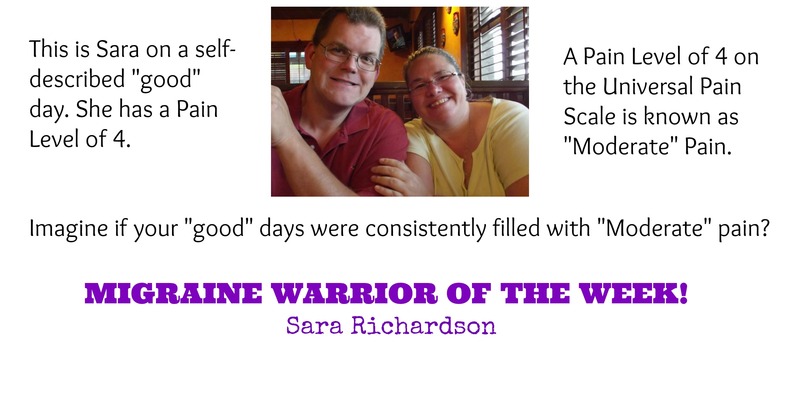 Welcome to “WARRIOR WEDNESDAY” and our second “Migraine Warrior of the Week!” As explained in a previous post, each Wednesday a different migraineur will be featured on this blog. Any pictures that are provided, along with their answers to a questionnaire will be posted here, with the hopes of providing alternate perspectives with regards to migraine and other headache disorders. These people battle migraines with determination and bravery and deserve to be celebrated and spotlighted for the way they live their lives despite chronic illness. Some “Warriors” will make mention of their personal efforts to raise migraine awareness: blogs, websites, Facebook pages/groups, books, presentations, etc. I encourage them to do this because I want everyone to have access to as much information as possible. I encourage you to take a moment to peruse whatever they are doing to help and to consider what you, personally, can start doing to make migraines visible and to stop the stigma associated with chronic invisible illness. At what age did you have your first migraine? 12. At what age were you diagnosed? 15. Chronic Migraines, daily headaches, silent migraines, status migraines. When I have one of my bad ones coming on, I have pain in the back of my head (at the base of my neck) and then I also begin to get confused. The worst one that I have ever had, I didn’t know who my mother was. I also lose some mobility – I get kind of dizzy and need to lay down. Since I don’t know what I should be doing when I have these, I pretty much can’t do anything – except lie in bed and try to get some rest. People tend to associate migraines with pain in the head. Other than head pain, what would you say is the number one symptom of your migraines that is the most debilitating? Confusion. Nicotine, caffeine, sulfites, nitrates, chocolate, aspartame, cheddar cheese, pork, sometimes dairy, sometimes citrus, heavy cloying smells, sometimes the sun (too bright), fluorescent lighting, weather changes, sometimes yeast……it goes on and on. Medicines, change in diet, surgery (I have a PFO in my heart to block a hole), biofeedback, chiropractor, physical therapy, all sorts of different doctors, and an occipital nerve block. No one knows if they can count on me to be there for anything because I never know how I am going to be feeling on any day, and if I am there – they also know that I may have to leave or lie down at any point in time. During an attack – help me to get home, and to take my medicine. In everyday life – ask if you can come over because you know that they may not be able to get out of the house or tell them if you are going somewhere (i.e. – grocery store) and ask if you can pick anything up for the migraineur. IT IS NOT JUST A HEADACHE!!! I have some support groups online that are for people with either/both migraine conditions or chronic pain on Facebook – Chronic Migraine Awareness (there is both an open forum – for the public, and a closed one (for people with chronic migraines to vent safely) and Purpose in the Pain Pen Pals – which is a pen pal group for people that have chronic pain to communicate with others through messages and the mail. Migraines are very common, however chronic migraine is worse than just about anything. When someone who has chronic migraine has one of their attacks, they don’t know how long that will last, how bad it will be, or how many people we will disappoint. When we have a migraine attack, we feel very alone and can get really depressed. Also, one of the worst things to say to someone with chronic migraine is “Oh, when I get one I take some over-the-counter medicine and it is fine after about an hour. Have you tried that?” Of course we have tried that! That’s one of the very first things that we have tried. Now, I have medicine that most people who have episodic migraines have to go to the hospital to get (when theirs get too bad for over-the-counter medicines to help) that I give to myself. The medicines that I have are injections and they can hurt badly when I have to give myself a shot. So I end up trying not to take my medicine, because even though I know that it will make me feel better (most of the time) it will hurt almost as much as my head already does. Or, it may NOT work, and that means that I will have to go to the E.R. Luckily for me though, I go to the E.R. that is affiliated with my G.P. Dr. and have a plan of action of what needs to be done when I have to go there – AND THEY ACTUALLY FOLLOW THAT PLAN!! There are a lot of migraine patients that when they have to go to the E.R. because their medicines aren’t working for them, they get stuck there for hours with no help, they aren’t believed that they are in as much pain as they really are, they are told that the medicine that the patient says will work – the doctors won’t give them – so the patient ends up getting some medicine and maybe an IV of fluids and then are sent home. What would you do if you were asked by a doctor, “What is the medication that has worked for you in the past?” And when you tell them the medicine that worked……your answer given is this, “Oh. We won’t give you that! We don’t give that to migraine patients. You are just a drug seeker, so I won’t give you that.” And this is what happens to you – even if you do have a plan of action from your doctor (on his/her stationary) that states for you to follow this plan. Think about it…………………………STOP THE STIGMA!!! WE ARE NOT DRUG SEEKERS, WE JUST WANT THE PAIN TO GO AWAY!!! !